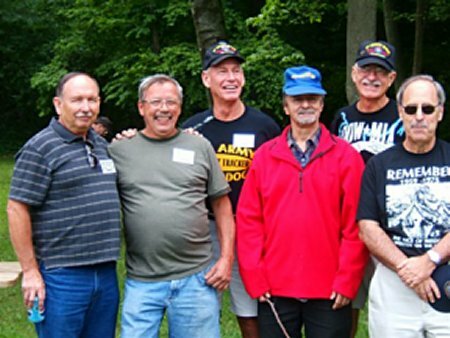 65th IPCT at the Picnic: From L to R: Ron Eitel; Bob Krise; Ken Goss; Bill Rich; Gary Morris; and their CO Mike Warner-Burke. Great to see these guys together! Even if you weren't there - this one's for YOU! The Big Red One Trackers - representing CTT #5, CTT #13, and 61st IPCT - From L to R front row: Chuck Steward, Ed Wheeler (who somehow took all of these photos too! 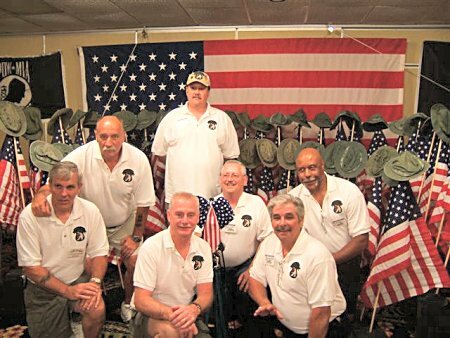 ), and Jerry Pritchett; second row: Norm Shaw, Denzil Lile, and Jearald Dudley; standing Tom Auer. I really had a great time visiting with these dear friends! 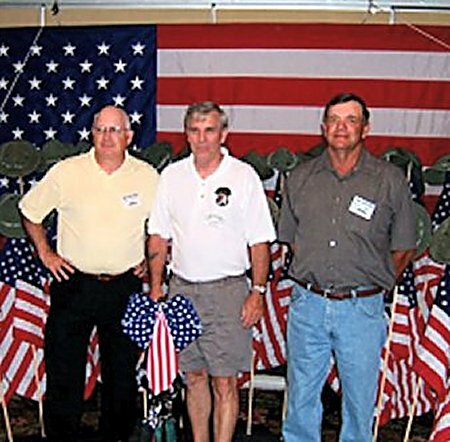 Representing the 66th IPCT - 25th Infantry Division were DeWitt Roberts, Bill Welch and Tom Auer. All you guys with the 25th, let's get with it for 2007, okay???? You need to support DeWitt and Tom! Besides, I wanna see you guys! 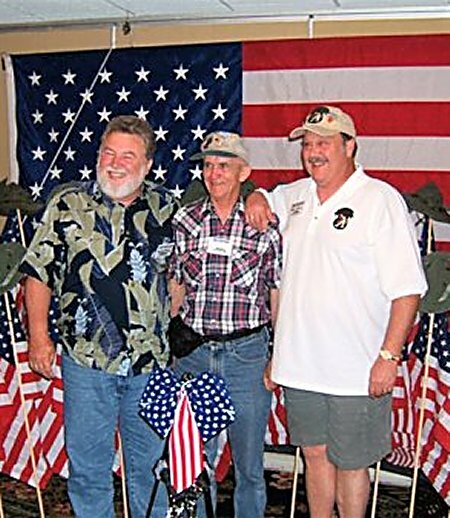 For the 557th IPCT - 101st Airborne: Don Campbell - Host of the 2006 Reunion; Chuck Steward; and Wendell Taylor. More Airborne Trackers needed for 2007, yes??? 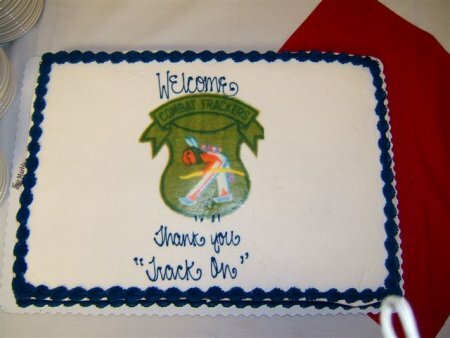 Here's a good showing for the 77th IDCT - 82nd Airborne with a 76th IDCT - 199th LIB representative to boot! 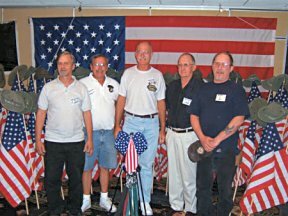 From L to R: Bill Rich; Bob Krise; Gary Morris; Ernie Muir (the Muirmaid is the ringer from the 76th!) and Bob Bonzkowski - who made the excellent woodcuts for the raffle! Our host and son - Don Campbell and I believe, Jason Campbell. Don, kindly correct me if I've got the wrong son's name here! 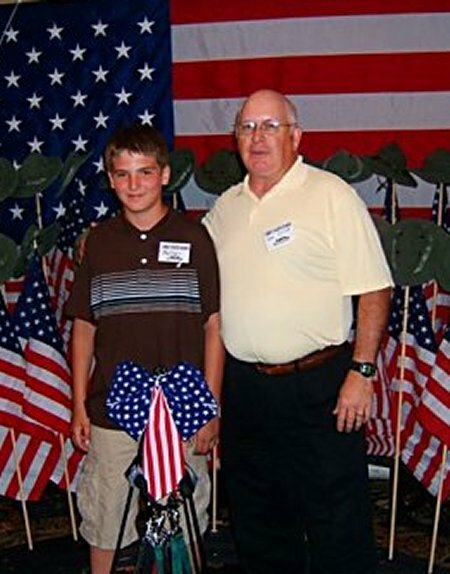 Don's son not only won most of the raffle items - but was treated to a most unusual military educational experience. He even got to meet Ho Chi Minh's grandson - more on that later! I won't describe some of the other more colorful things he heard and was exposed to, but his Dad assured us that he would erase his memory banks of the entire event. Thanks to the entire Campbell clan for their hospitality - we really appreciate all the effort - and had a wonderful time!